"The movie where Liam Neeson punches wolves." That is how history will remember "The Grey." And yes, the image of Neeson taping broken miniature liquor bottles to one hand, and a knife to the other is most indelible one in "The Grey." But the film is not quite as silly or dumb as that moment would have you believe. 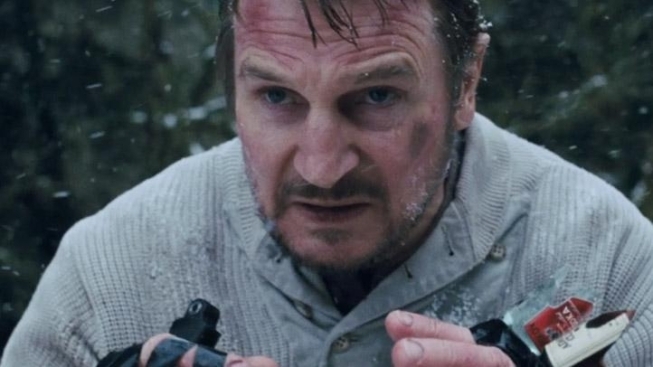 Neeson stars as Ottway, a loner with Sarah Palin's dream job: using his marksmanship to protect pipeline workers from wolves in the wilds of Alaska. It's a cold, lonely existence that seems to suit a man who is constantly working on a letter to the wife who left him, when he's not contemplating suicide. On a flight back to civilization, his plane gets caught in some turbulence and thrown to the ground, killing all aboard except him and a handful of other men. Cold, exposed, banged up and ill-equipped, the survivors must decide what their bets plan of action, with only Ottway skilled enough to make an informed decision. What follows is, at its core, a study of the intense survival instinct that gets some of us out of bed, others out of smoldering plane crashes. Neeson is one of those guys who moves seamlessly back and forth between low-brow and high-brow fare. Incredibly, his presence magically lifts his genre work, like "The Grey," without dragging down his artier work, like, say, "Schindler's List." Ottway isn’t just a grizzled tough guy, Neeson brings to him a soulfulness to him that makes him at least relatable if not recognizable. He brings a depth to the role that your standard action stars might not be able to. Writer-director Joe Carnahan made a name for himself with the gritty junkie cop drama "Narc," but followed that up with "Smokin' Aces," an over-stylized mess that wanted so badly to be a Quentin Tarantino film it could barely breathe (though big ups for using John Cale's brilliant "Big White Cloud"). Next for Carnahan was 2010's "A-Team," with Neeson in the lead as Hannibal Smith, a film so over-the-top it featured a aerial dogfight that included a tank. But Carnahan here shows admirable restraint. Despite such dubious nonsense like the aforementioned nip bottles, wolves the size of horses, a few footraces that shouldn’t have lasted more than 3 seconds and a jump that Butch Cassidy and the Sundance Kid wouldn't've tried, "The Grey" is a surprisingly rugged journey. These men are in serious danger and grossly overmatched, leaving them to battle for every minute of life. Though the "The Grey" makes a sincere effort to contemplate life and death, and our survival instinct, it's a still an action film. It's not transcendent, but Neeson's performance makes it worth the effort.